People cooking up a traditional Thanksgiving feast can be thankful it won't be as expensive as it was last year. 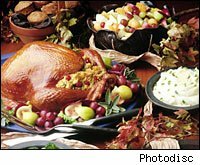 The price of making a traditional Thanksgiving meal -- turkey, stuffing, cranberries, pumpkin pie and all the trimmings -- will drop 4% this year, according to the American Farm Bureau Federation. That's the biggest decline since 2000, says Bloomberg News. The average cost of this year's feast for 10 is $42.91, a $1.70 decline from last year's average of $44.61, according to the federation's 24th annual informal price survey of classic Thanksgiving items. Prices are nearly at their 2007 level of $42.26. The survey was done by volunteer shoppers. "Consistent with the retail food price declines seen throughout the year, consumers will pay just a bit less for their Thanksgiving feast this year," said Jim Sartwelle, an AFBF economist, said in a press release. Though this may be good news for consumers, it's another lump that farmers have to take. For instance, turkey production is expected to be down 8% to 9% this year, according to Sherrie Rosenblatt, spokeswoman for the National Turkey Federation. Wholesale prices have also declined by about 5 cents a pound. None of this should hurt consumers who are often able to get their turkeys for free during supermarket promotion. "It has been a tough year for the turkey industry as it has been for most industries in the United States," she says. "The turkey industry has had a year of high feed prices, which make up 70% of the cost of producing a turkey. But, she says, "we see the possibility of a light at the end of a tunnel." For cranberries, the story is much the same. Wetter-than-usual weather is depressing output in the top two cranberry growing states Wisconsin and Massachusetts by 18% and 30%, respectively. But not all states are suffering, as New Jersey cranberry growers are expected to boost production by 5% over 2008, according to the Star-Ledger. Fresh cranberries like the ones used to make sauce and other Thanksgiving dishes command a premium price because of the labor involved in harvesting them. They make up about 5% of the crop. For David Farrimond, executive director of the industry-supported Cranberry Marketing Committee, this year's harvest of the tangy fruit was nothing to be concerned about. "Growers got paid a lot more for last year's crop," he says. "Actually, this was a normal year." What's helping cranberry growers is the growing popularity of Thanksgiving meals in places outside the U.S. such as Germany and France. Now, about 25 percent of the U.S. cranberry crop is exported. But not all farmers are clucking: The European market is not open to U.S. turkeys.